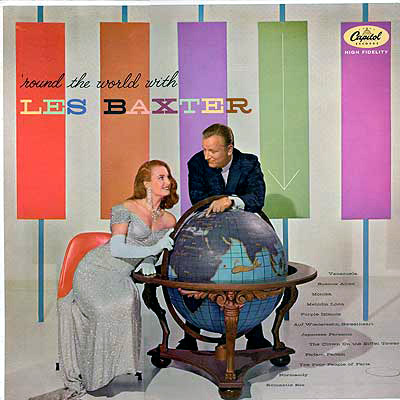 Notes: More nomadic wanderings from our man about town, Les Baxter. Moving from Buenos Aires to Paris to Normandy and so on until finishing up in Romantic Rio this record is all over the map, literally. 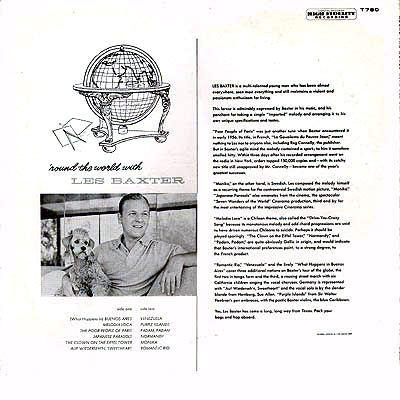 Les takes his usual approach to the music and even adds an original tune ("Monika") to his global trek. Sue Allen, the lovely blonde from Hamburg gets he vocal solo in "Auf Wiederseh'n, Sweetheart". More Baxter magic for those who appreciate such artistry. And the nattily attired couple on the cover are obviously jet-setters planning their next foray in search of new adventures in music and melody.